“This is our lake-house kitchen. It was done this last year as part of a whole house remodel. We did most of the work ourselves, with some sub-contract help where we needed (after lots of experience, we know our strengths and weaknesses!). “I love it because it’s compact, efficient, and open to the main room with easy access to the decks. 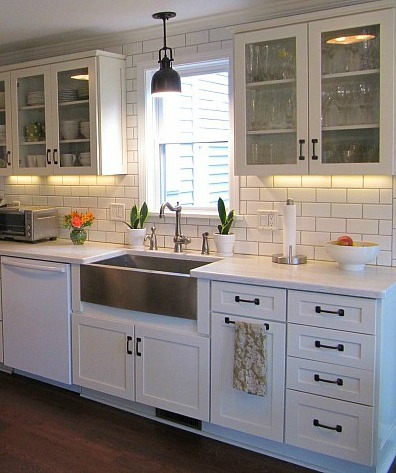 I always envisioned white cabinetry here and finally got it when we did the kitchen as part of a whole house remodel. The challenge was to stay within the footprint of the house (not big at all) but still open up the space. You can see more on Robin’s blog Decorating Tennis Girl. “Last year we down-sized from the suburbs to downtown when we bought a nice and bright townhouse. The peninsula holds a farmer’s sink, dishwasher, wine cabinet, and glassed-in cabinets for extra dishes. Thanks to the readers who submitted these for my contest. 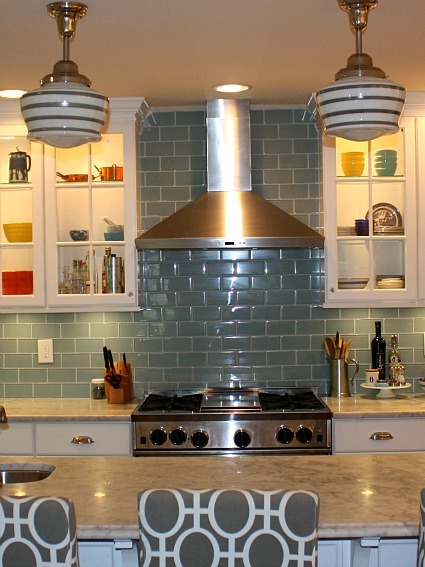 It’s great hearing what everyone loves about their kitchens! 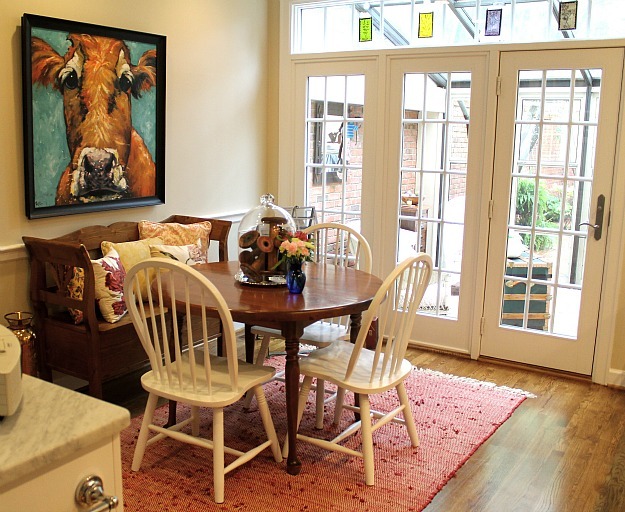 I love that Frigidairestove in Robin’s kitchen and the cow painting in Janette’s. Great conversation pieces! Me too!! I always loved the home from the Bewitched television series and that stove always caught my eye. I instantly recognized it from Bewitched, too. It’s always fascinated me because the burners are on a big drawer. I’d love to see one operate. This is the first one I’ve seen still in use. I love all of these – and can really appreciate a “small” kitchen much more than a large fancy gourmet one. I especially like some of the older ones – they seem so full of character and good memories! Kathleen’s kitchen is perfect! Love those windows. Stacy’s kitchen is a very close second, in my opinion. Love the colors in both. Oops, Rosie; you left the cabinet door open! I really like Rosie’s kitchen and I’m trying to figure out where she could put a cow picture, which I also love. thanks, Vicki 🙂 I think a cow picture would be great, but one thing we don’t have in our small space is wall space! I do have a little ceramic cow milk pitcher that lives on the windowsill. I always think that small rooms and rooms done on a budget are the best. It takes a lot more creativity to make them fabulous. All of these kitchens are great. Great choices in finishes and loads of personality. Wow! That bank of windows above the counter in Kathleen’s kitchen is heavenly, and how cool is Robin’s Frigidaire?! (I think it’s fun to imagine the 50’s housewife who probably thought she’d died and gone to heaven when she got that!) All of these kitchens are proof that style can exist in a home of any size! I am in LOVE with Lulubelle the cow. What a fabulous and quirky piece to have in your kitchen!! Love seeing these! So much more like the kitchens most of us live with, and love. I am crazy for the soft, serene colours in Stacy’s kitchen (#7). And that bank of windows in Kathleen’s kitchen (#1). This is a great series! I love Kathleen’s kitchen! 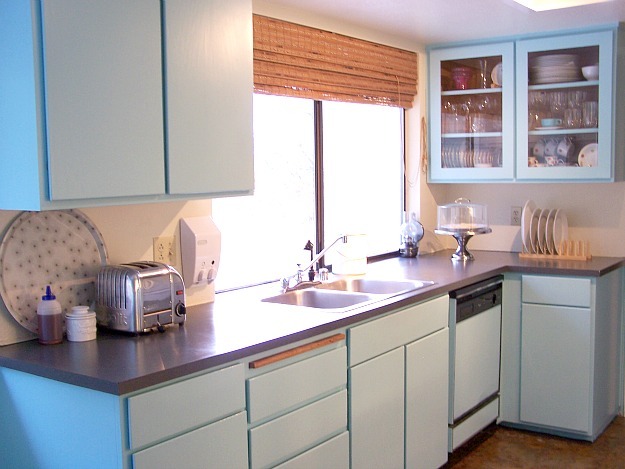 I love the windows, the colour, the hardware and the dishdrawers. We have dishdrawers too and love them! 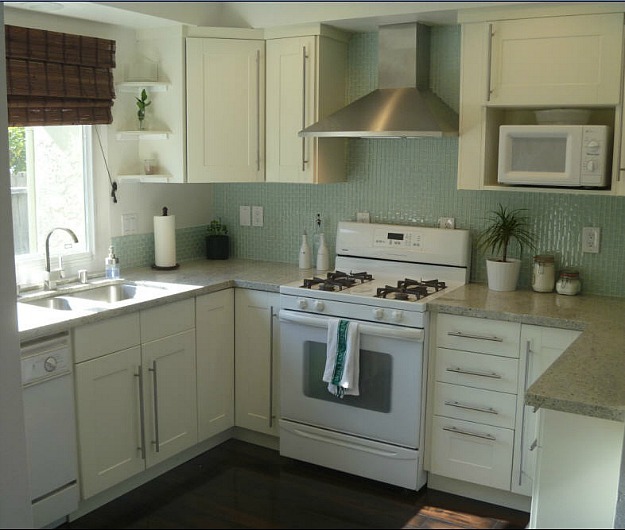 Is this kitchen in the US? Thanks for all the nice comments! Dishdrawers are great for small kitchens. Yes this kitchen is in the US (Michigan)! 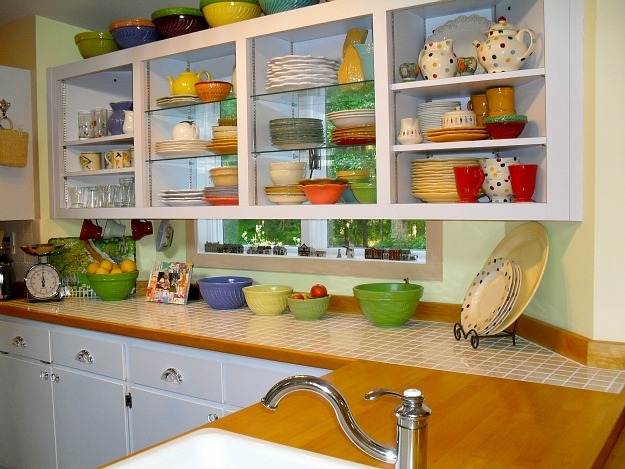 Lynda’s colorful kitchen made me smile. (It’s so that you’ve included kitchens that are not *shiny* and new.) It’s fun to see what folks can do without the big budget renovations and those colors just make it exciting!! Thanks! We love using all those colorful dishes. I seem to have a weakness for dishes. Lots of lovely small kitchens. I do love a smaller kitchen, probably because I have one myself! All of these are wonderful, and makes me glad for mine! This has given me some great ideas for mine when I update. They’re all winners! These are great. I like Rosie’s and Janette’s the best. Love that cow! 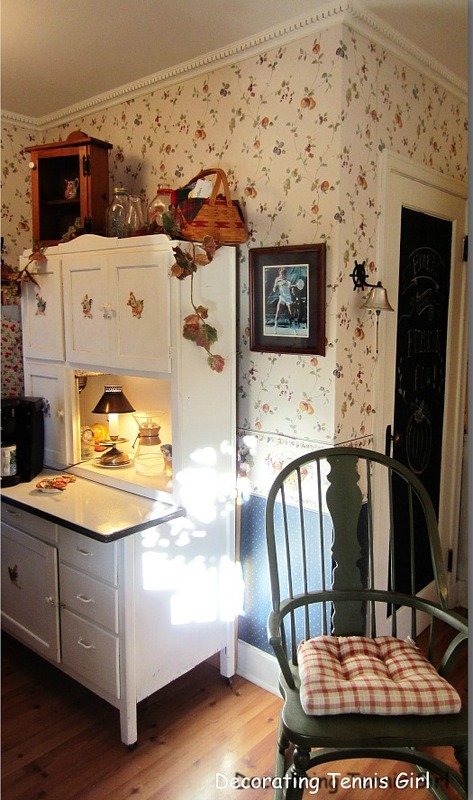 My kitchen is tiny, and I wish it was just a little bigger, but I love the old-house quirkiness – fireplace, back staircase, under-stairs pantry closet, etc. Kathleen’s #1 and Stacey’s #7 are giving me lots to think about. Thanks for posting kitchens in small spaces. This is my design challenge as well. I love these “every day people’s kitchens” the most, Julie. Thank you for sharing. WHEW! Auto Correct is going to do me in! Thanks Rebecca! The new layout of this kitchen is really helping me make use of the small space! I love all the kitchens! As this Baby Boomer ages, I yearn for such kitchens. Easier to clean and less distance to walk for baking supplies. That becomes so important over time. I grew up in a 1950s home with a smaller kitchen and saw my mother rearrange things so she could save every bit of energy and still continue to bake (a passion) into her 90s. It may seem a small matter but truly matters over time. 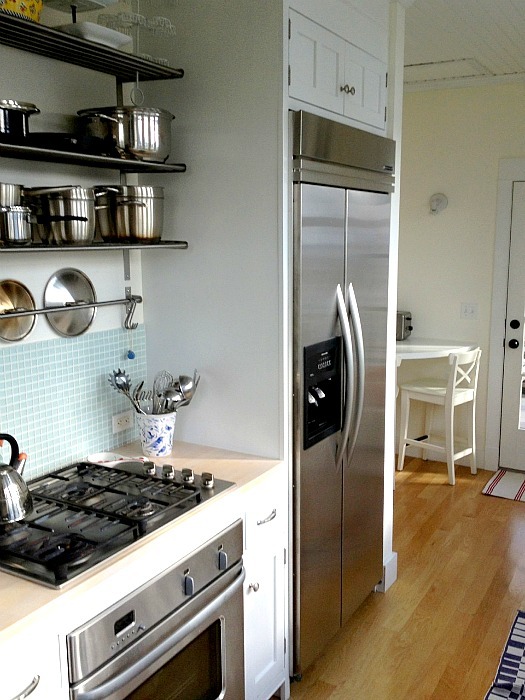 I exercise regularly and stay fit but I’d still appreciate a smaller kitchen, especially since I’ve gotten rid of all the “gadgets” I never use. I don’t need the extra space to clean. Agreed. I’m not ready to get rid of my gadgets yet, but I love the efficiency of my small kitchen. Don’t envy my friends’ huge kitchens at. all.! I love Lynda’s kitchen! I wish she would give me all of her fun & colorful dishes! Wow, it would be amazing to have a kitchen as roomy as any of these. Mine is less than 40 square feet, under 8′ x 5′. 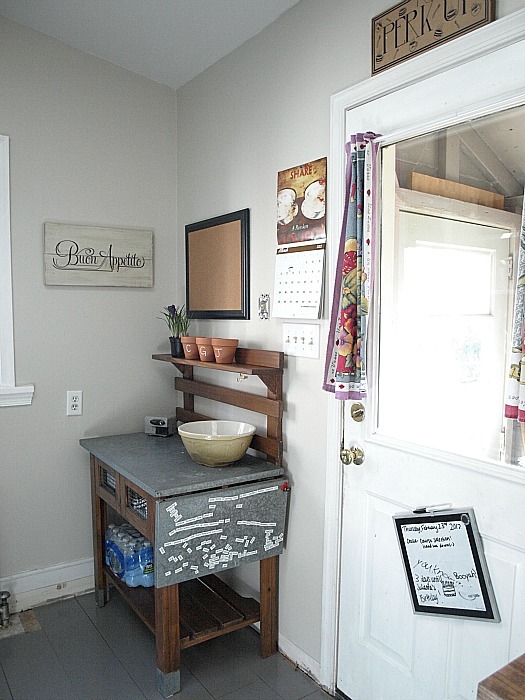 It’s fun seeing Hoosier cabinets and open shelving for display… such luxuries! I dream of having a full-size refrigerator and a stove bigger than 24.” My biggest wish is for an old-fashioned wooden pantry to hold all the dishes that are out of reach in my current closet, I mean, kitchen. I love the rug in Kathleen’s kitchen. I need to replace a runner up my stairs and would like something similar. Does anyone know the source? All the kitchens are wonderful. It doesn’t take space to make a beautiful kitchen! The rug was purchased several years ago at IKEA. They may have some similar ones now. I love Robin’s kitchen the best, especially the stove. I just love cozy kitchens, not the big monster kitchens. Mine is in the middle somewhere, with my pantry in the garage. What do people do with their Dish Rack (drying rack). I know you can’t put everything in the dishwasher. What do you do with the non-dishwasher safe stuff? The rack does take up alot of prep-space in my small kitchen. I just bought a drying pad and then wondered why. It was $5 at Big lots and decided it may be worth it instead of dealing with a rack. Now I know it was a positive purchase, may go back for more. A stainless steel basket that stretches over the sink is another look for. It is deep enough not to see the dishes in it and can be used for washing veggies. As you can tell from the picture of my kitchen (above) we actually dry our dishes on the stove since it’s a flat electric. We just put a dishtowel on there and then stack the stuff on the towel. It works very efficiently when the oven is still warm. We do keep a drying rack in the mudroom off the kitchen for parties when we have a lot to dry. I bought Lulubelle (the name we gave her) on Etsy through a vendor called Roz Art. She is located in Texas and shipped the painting to me here in Kentucky. 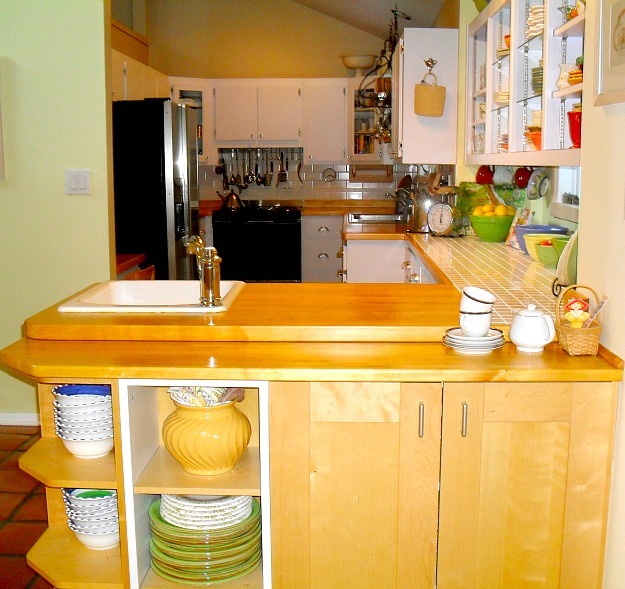 I really really enjoy” real people” kitchens – the types of kitchens which are not over the top. Difficult to choose a favorite but if I had to choose I would choose Robin’s kitchen..
Are all her pictures both with the yellow walls and the wallpaper of the same room? Either way her kitchen is beautiful and cozy. Beautiful kitchens! I especially like the first one. These kitchens are all bigger than mine — an 8 by 8 galley in an old Tudor Cape. But a girl can dream, right? Hi Julia I love the stove (they don’t make them like that anymore pity) love the cow and the kitchens are all lovely. It’s very hard to choose for me it would have to be no.5 & 8. Thank you for sharing this was fun. Regards Esther from Sydney (one minute you have the air con on the next you are thinking about turning the heater on) climate madness. Julia–I love these! Thank you for sharing. 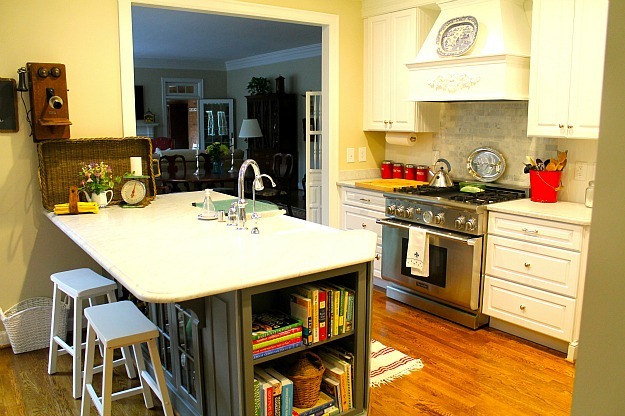 A cozy, charming kitchen with character is the best place to prepare and share a meal any day of the week!! Really a great post! 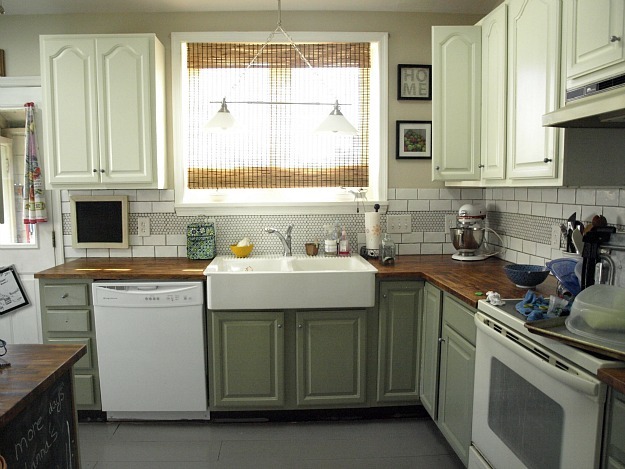 I couldn’t agree more with the comments about how wonderful it is to see “normal” kitchens. I love the eye candy of fabulous $100,000 kitchens as much as anyone but there is something special about making what you have work within your budget. And I love the cow, too! Oh my goodness… the Frigidaire Flair stove takes me right back to my teen years. My mom had this same stove and I thought it was so modern! It has a rotisserrie on the left side, the burners slid out and my mom’s was coppertone. 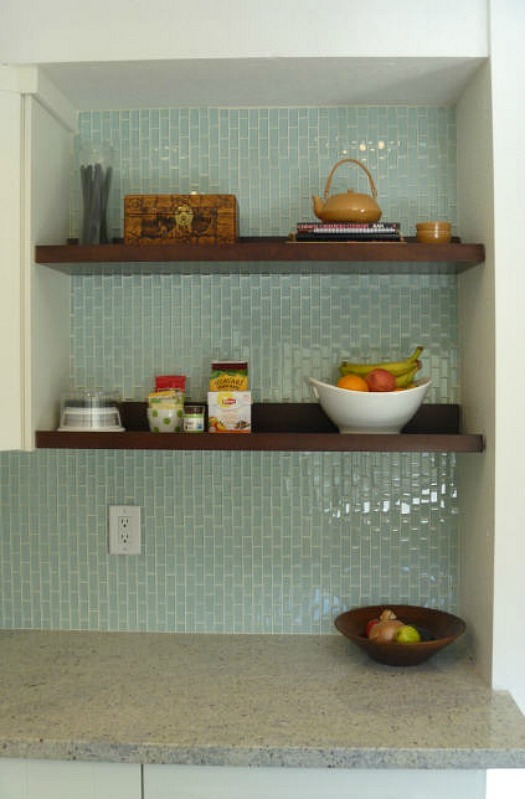 I really enjoy seeing these smaller kitchen – they pack a lot in a small package. What great kitchens. Each one has things I like about them and I love what each homeowner did with the space they have. I love these kitchens so much! and the spirit in which the owners posted them. I was so sure nobody would understand my why my kitchen is the dream kitchen that I longed for for 25 years, even though it doesn’t have a chandelier, an island, etc. that I didn’t even enter it in the contest. 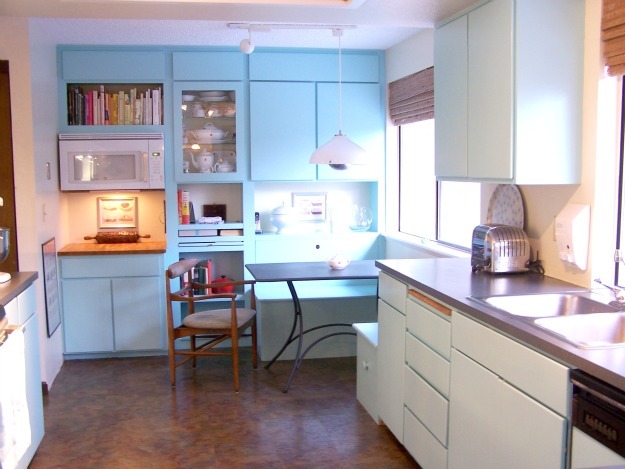 Now I know that others see that even a galley kitchen can be a dream kitchen. Thank you Julia! and also, these kitchen owners. Thanks for showing smaller kitchens. I too have a kitchen that’s on the smaller side and its a great space to work in. But best of all easy to keep clean! In regard to Stacy’s tiles, I love to them. They’re a great colour and I like the way the tiles have been laid long ways. Thanks Leeann! The tile orientation is one of my favorite features, too! Enjoy all. Am a small 50s kitchen owner too, that the PO updated. I can’t pick one, rearranging mine and keep looking at all the details. They do seem so much larger than mine. The biggest difference is having eating areas within or nearby and being open to other spaces. Would love to see more of the entries. Thanks for giving the smaller home so many possibilities to peruse. 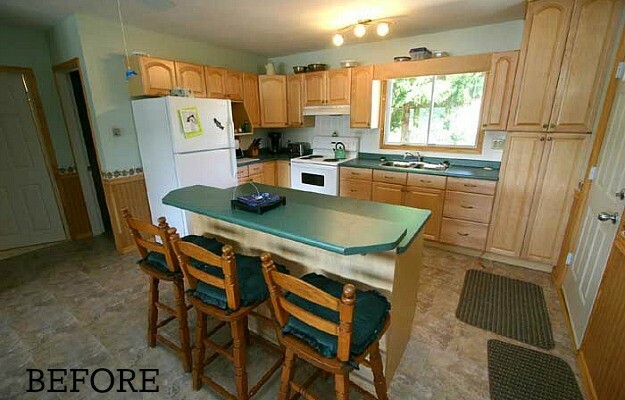 Love seeing these smaller *normal* kitchens. I admire the hard work and ingenuity of the DIY’ers especially. Kathleen’s is my favorite, probably because it’s most like mine ;-). Mine is from the 1920’s and is long and narrow. We gutted it when we bought the house in the 80’s because it was really ugly 40’s-50’s plywood cabinets and an inefficient layout, and we opened it up visually to the dining room, making it feel much bigger. I tried to keep a vintage feel and used a classic style with white cabinets. I recently put in a new backsplash and countertops and the kitchen is renewed and even more classic, I think (added the white subway tile). Love the long windows in Kathleen’s. I also have lots of windows, and when we cut the pass-thru we lost some wall space, but the sacrifice in storage is worth it. Over the open area we have glass-front cabinets filled with my grandmother’s and mother’s china and crystal. It works for me and I really don’t want a huge kitchen with so many steps and areas to clean. Thanks for these. Oh yes, and I LOVE Lulubelle! P.S. Love Stacy’s, too. Our mountain cabin kitchen is about that size (tiny) and we often have 4 cooks in there. We do have an island and the space is open-ended on two sides. Nobody seems to mind dancing around each other and we have lots of fun. Everyone is always wanting to come to the cabin. Question for Stacy: where did you put your refrigerator? HI Carolyn! I moved the fridge into the old dining area, basically on the opposite wall of where it was in the original picture. I have a “row” style house so i just shifted everything down the row, so the the great room is now fridge/pantry, dining room and living room. 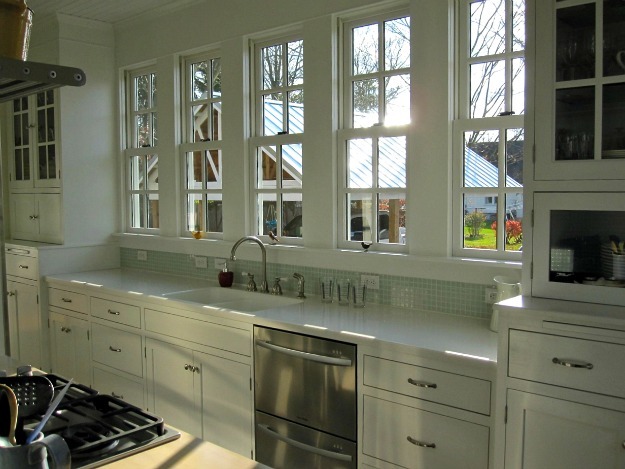 My favorite’s are: Kathleen’s – I just love all the windows and the white cabinets, how light and bright! I also like Janett’s – how light and bright it is, also I luv Lulubelle, and the nubby rug under the table! 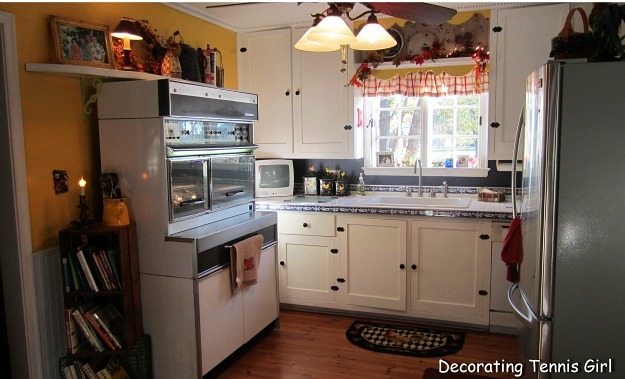 I would luv to paint my oak cabinets from the 90’s white, but then I’m left with off white laminate counters…. Wow, Julia!!! 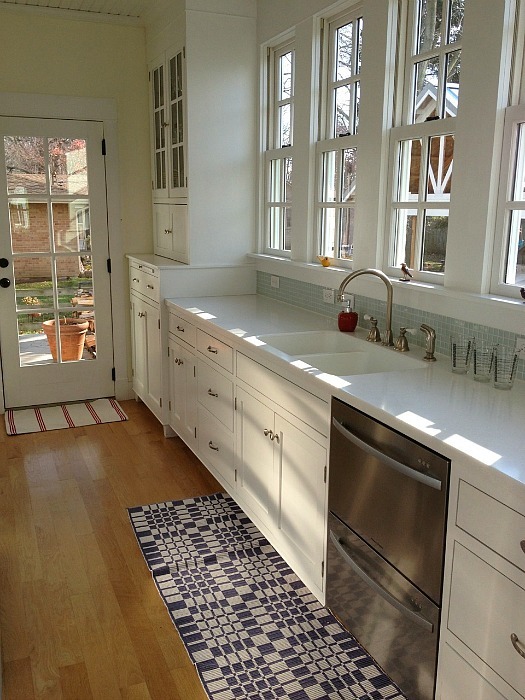 Thanks for including our kitchen in today’s post. I really appreciate it. 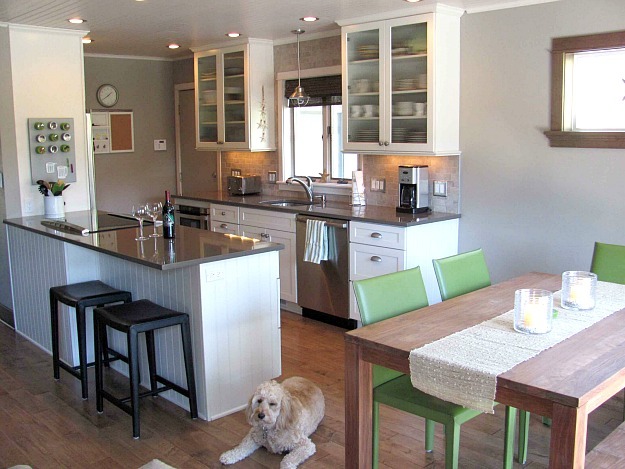 It’s hard to pick a favorite, however there is something special about Janette’s kitchen! I would love to just sit down and visit with her in this wonderful room! All the natural light, the finishes, textures and the cozy,fun vibe. And of course, I love Lulubelle! Every kitchen needs a special feature. I have a small white kitchen in my 30’s stone cape code cottage with arched doorways, handmade English tile, deep apron sink, built in plate rack, etc that I wouldn’t trade for anything! Little kitchens can live big when designed with function, finishes and creativity. P.S. Julia I love your website! Yay! 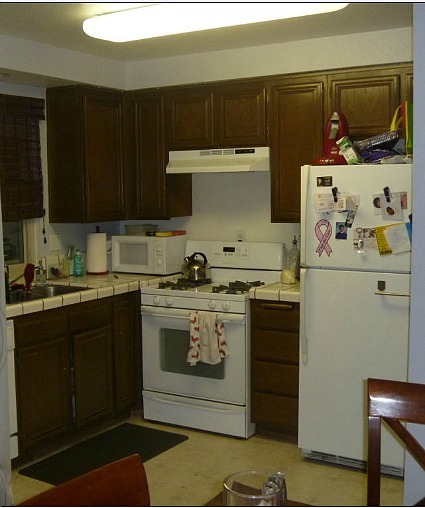 I love to get a peek at “regular” kitchens. They are beautiful and realistic, full of ideas. My favorite is Janette’s. I love that peninsula (pinned it) and the idea of downsizing. Thanks for sharing, all! Thank you Julia for having this website! Although my home was built in 1995, I am trying to make it my own. I have replaced all the carpet (there was different carpet in every room, even the closets and kitchen). The baths had vinyl. I replaced most of it with bamboo floors, and put porcelein tile in the baths and entry. 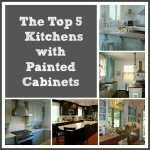 I hope to redo the kitchen and baths, so I am very excited to see all these beautiful kitchens! Thanks! Julia, thank you so much for including my kitchen!!! It was an exciting day for me! I enjoyed seeing all the small(er) kitchens! Thanks for all the nice comments too! i have the same kitchen as stacy (#7) and am really interested in knowing where she put her fridge. thanks!! Hi Kim! I moved the fridge over to the opposite wall of where it was originally. I have a row style house so pretty much i just shifted everything down the row. The new fridge/pantry area is next to the dining area. I can email you a floor plan mock up drawing if you’re interested! I love Lori’s kitchen. Awesome! I love Lori’s, an idea for a small space.